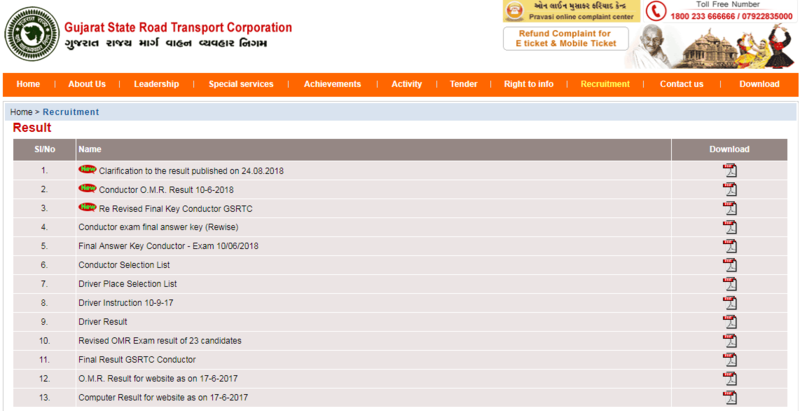 GSRTC Driver Merit List 2018 PDF Download @ www.gsrtc.in – On 1st October 2018, Board of the controller of examinations, Gujarat State Road Transport Corporation has officially released the GSRTC Driver Official and Final Merit List PDF online on an official website. For total 933 vacancies of GSRTC, recruitment examination was held earlier. Written test, without any paper leak news, was successfully held in June 2018 keeping written test and interview as the major two stages of the selection procedure. Apart from this, the latest updates available on the recruitment section of official website are Clarification to the result published on 24.08.2018, Conductor O.M.R. Result 10-6-2018, Re-Revised Final Key Conductor GSRTC, Conductor exam final answer key (Revise), Final Answer Key Conductor – Exam 10/06/2018, Conductor Selection List, Driver Place Selection List, Driver Instruction etc. Seems like that’s all you needed to know about Gujarat State Road Transport Corporation’s GSRTC Driver Merit List 2018 PDF Download @ www.gsrtc.in. 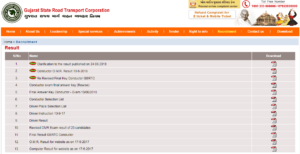 For more updates, you can also visit the official website www.gsrtc.in and other portals. Under the recruitment section of the official website, Board of Controller of examinations has released the Document Verification Website List 19-9-18 to 25-9-18, checklist for conductor, conductor document verification list, Nivida, Assistant security Inspector notification, assistant traffic inspector notification, assistant traffic superintendent notification (official for job vacancy online), recruitment notifications PDF for junior accountant, junior assistant, security assistant, senior accountant, senior assistant, storekeeper, traffic controller, traffic inspector, clerk, provisional answer key Namuko K, conductor exam 10 June 2018 provisional answer key, annexure AB for conductor, Conductor to OMR Exam instruction and many other.